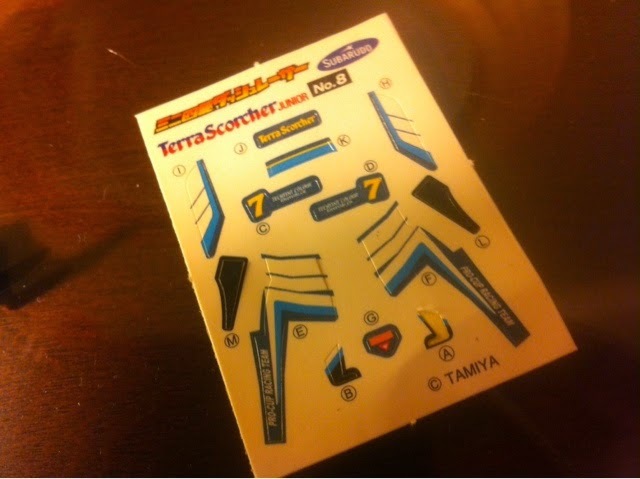 Whist travelling for work I managed to stumble upon a little piece of Tamiya RC related coolness. So I thought I would do a quick piece about it whilst sitting in my hotel room suffering from jet lag at 3.am! 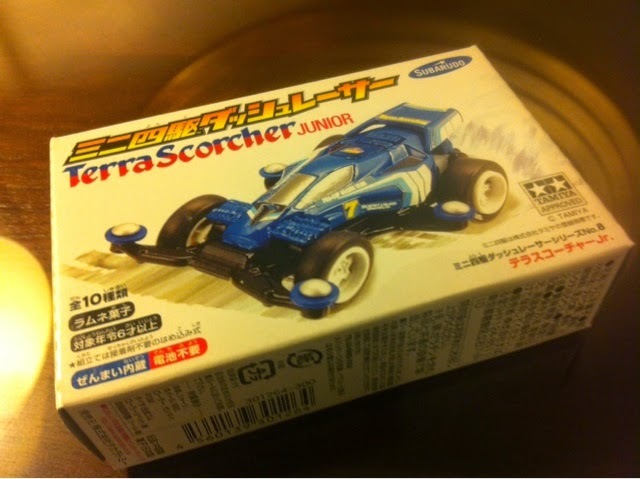 It is a micro version of a miniature version of a Tamiya Terra Scorcher. 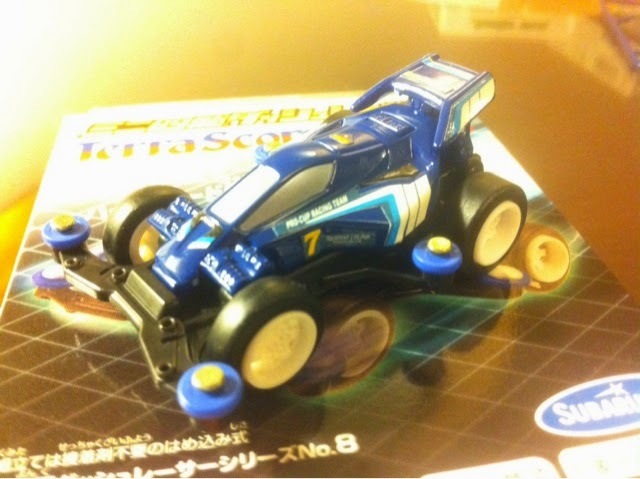 As you can see it has rollers on the outside (Like a mini 4WD). 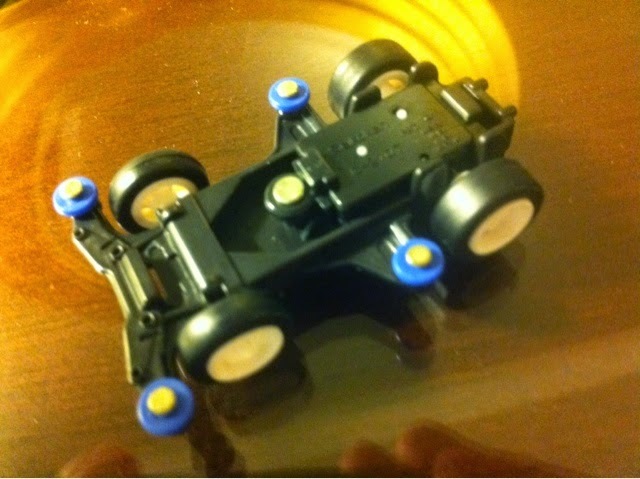 However this is much smaller than a mini 4WD, roughly 1/64 scale. 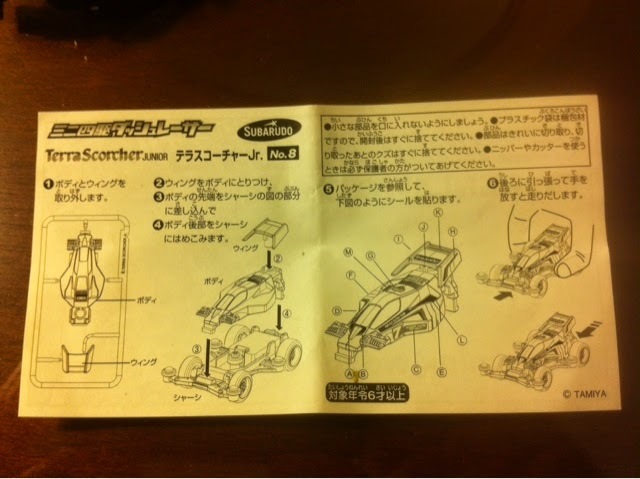 These cars were released in 2007 by Subarudo (Part of Tomy) under licence from Tamiya. It is part of a series of 10 mini replicas of Tamiya rc classics including a Topforce Evo, Avante and Hotshot. 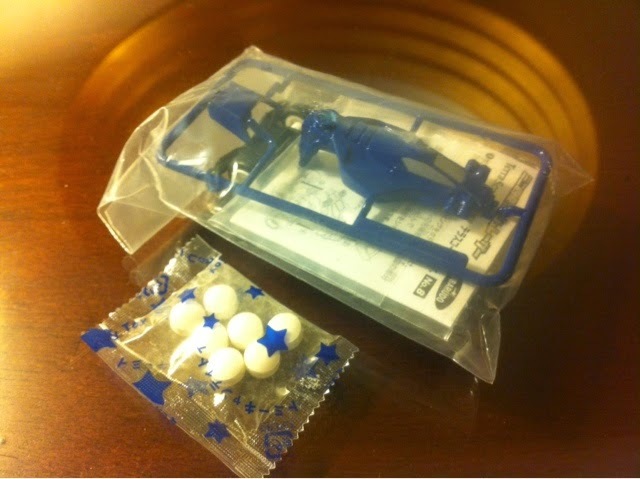 As you can see the box contains a part painted body shell, instructions, stickers and a mysterious bag of sweets. 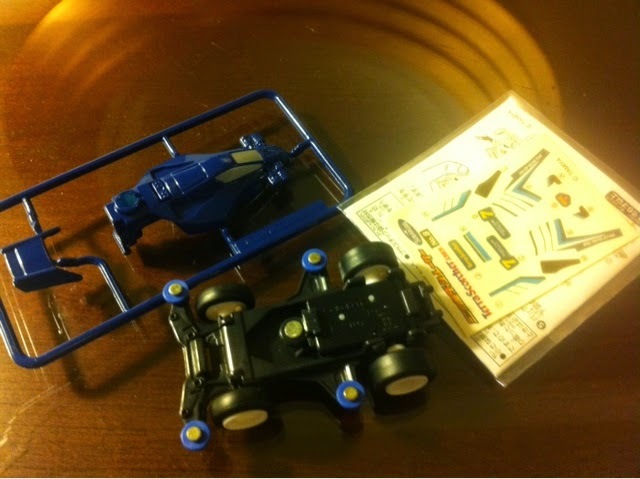 When taking a closer look you can see that the attention to detail is actually very good and that the decals are accurate to help achieve a very small replica of a Tamiya rc car. As you can see there is very little to do, although once you start to try to apply the miniature stickers then it soon takes some time! Sitting in my hotel room at 4.AM jet lagged and a little numb after trying the hard liquor route to getting a good nights sleep, does not make me particularly precise when using my sausage fingers to stick 2mm stickers in the right place. However after a bit of perseverance I managed to get them all on. Here is the final result. Once the stickers are on it does look really good for a car that is around 4cm long. Well it wouldn't be a review without a track test. So I hastily created a small track on desk in my hotel room. 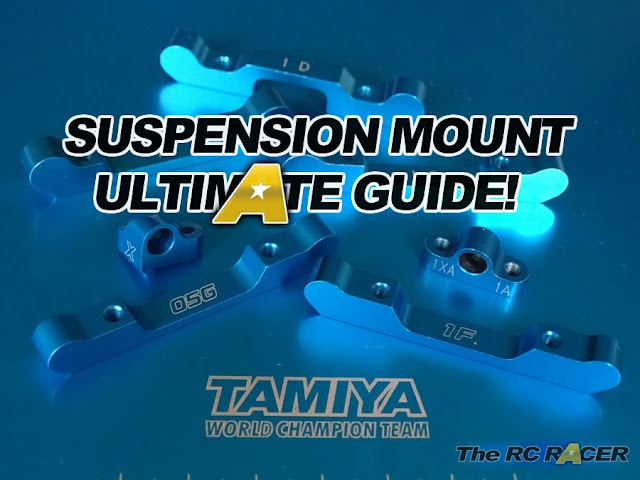 As you can see from the video, the car is able to take jumps with ease, a smooth and quick acceleration curve is produced once you wind up the motor and the high grip rubber tyres are excellent to hold grip on both he smooth glass surface and the laminated card ramp. The brakes are not so good. I would do a range test on the motor but it's the middle of the night and a hungover, jet-lagged Englishman roaming the hotel pushing a miniature toy car would not go down very well with the hotel clientele. 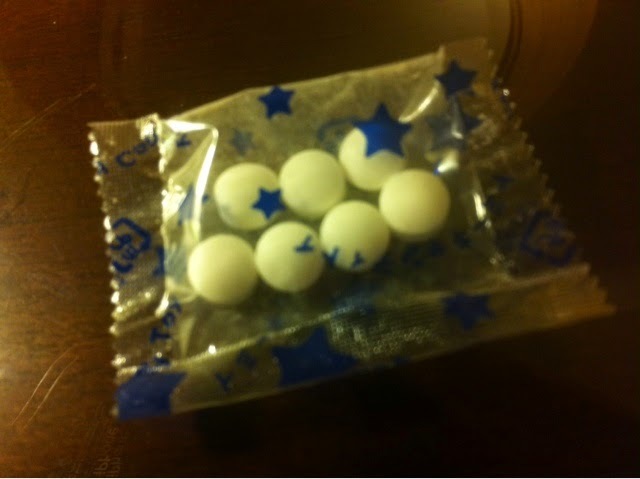 Last but not least it's time to taste the sweets... After popping one in my mouth I can confirm its a sugary zesty taste.. Although after munching through them all, it dawned on me that they are 8 years old! So I'm now off to bed, let's hope will have no adverse effects... Wish me luck! Ive been thinking of getting a 1/32 to relive childhood memories to place on my work desk... they used to sell for only $10 at my local supermarket back in the early 90s! I remember often looking for the latest releases etc.